As great and brilliant as Mies’ name is in terms of modern architectural history, there are no grounds for feeling at ease when it comes to the preservation of his edifices: In the last few years several of his buildings around Berlin, for example, were in some cases restored only very shoddily, and often – as in the case of the Lemke building – even at the expense of the existing historical building fabric. 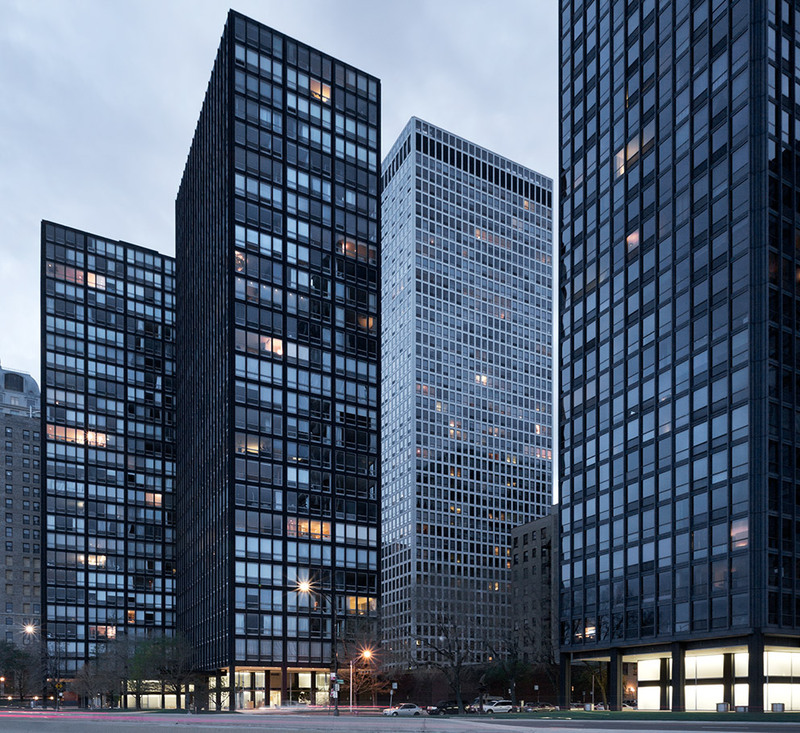 Of all things, the meticulousness of the structural details, which was always so important to Mies when he devised his designs, is absent in many cases of restored Mies buildings today. 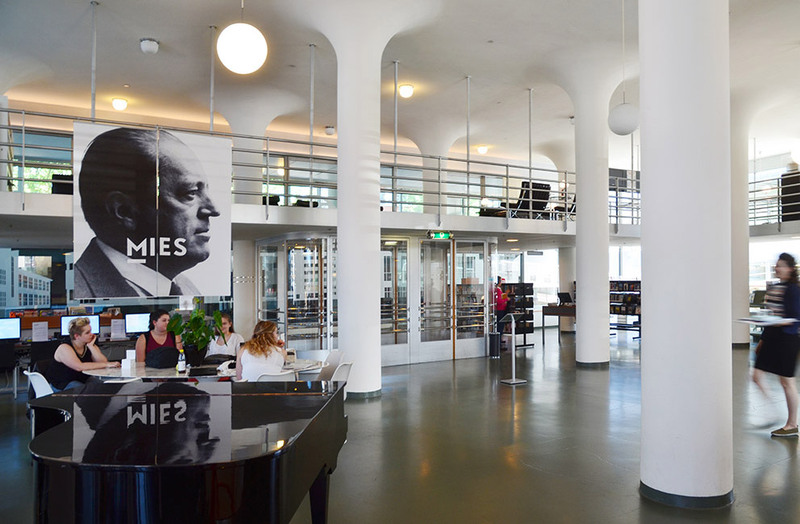 In the exhibition in Heerlen, however, the curator Andrea Croé does not address the broad spectrum of Mies’s structures that have been restored or converted, but rather focuses on the five major exemplary edifices: The exhibition showcases five current best-practice examples in Europe and the United States. Chicago is represented by Crown Hall on the IIT campus, the neighboring Robert F. Carr Memorial Chapel, and the apartment high-rises on Lake Shore Drive. From Europe two pre-War projects were selected whose subsequent use could scarcely be greater in contrast: Whereas Villa Tugendhat in Brno, having been restored as far as possible to its original state, was turned into a museum, the Verseidag production and warehouse buildings in Krefeld, some of which are still ruins while others are in the process of being restored, will soon be the heart of a new business park for creatives. The designers from the Berlin studio “chezweitz” succeed in the exhibition in the catacomb-like basement of the Glaspaleis in ensuring a not exactly straightforward topic appeals to the senses and is at the same time meaningful. Completely encrusted with paint and rust, the last of the modular window frames to be salvaged from the Verseidag buildings hang on a wall like so many found objects. 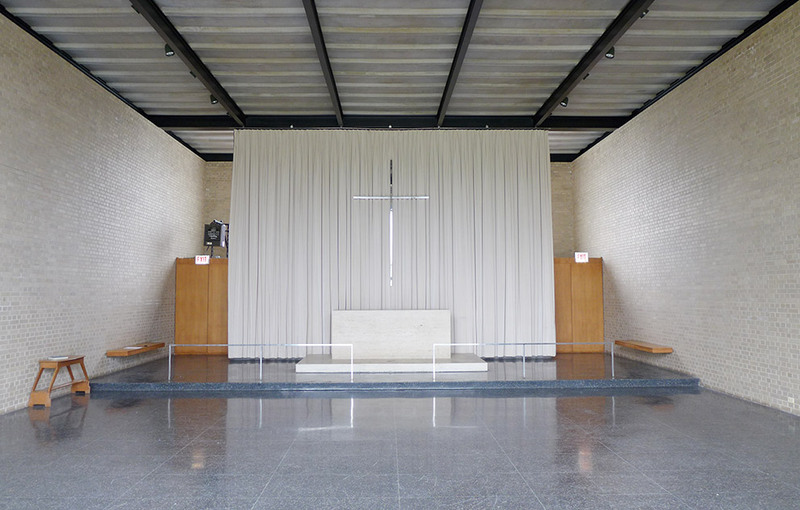 They contrast poignantly with the adjacent remains of the rosewood furniture from the Villa Tugendhat, and next to the steel suspension systems for the bag-shaped lamps that hung from the ceiling in Carr Memorial Chapel. These relics, which convey Mies’ understanding of material and his interest in carefully crafted details in an extremely tactile manner, are followed by a scenographic, architectural journey to the settings featured in the exhibition: The video “Inter/view” by Berlin-based artist Dominique Müller projects exciting lush panoramic images of the five buildings and their surroundings, superimposed on one another, on to a 20-meter-long wall. The intensity of the spaces, as well as their current use is captured in very atmospheric images. When one has stood up after sitting on the long Barcelona bench, an original dating from 1968 no less and from where one can watch the video, the part of the exhibition for which one needs a little more endurance begins. But it is worthwhile. At various table-top stages along the way, the complex history of historical designs and their realization, of successive uses and the associated structural changes, of disfiguring and successful repairs, and finally of the restoration envisaged in each case, is presented in detail and in a precise, very clear, comprehensible manner. And if you want to know more you can simply study the plans provided. 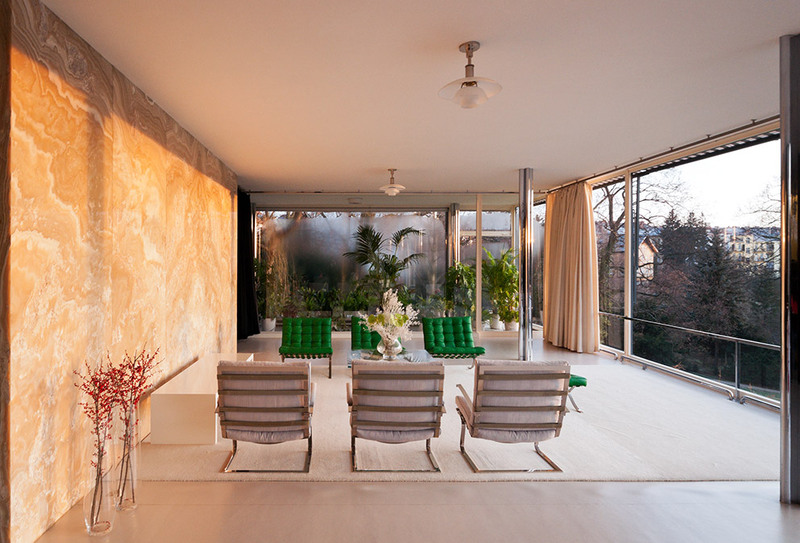 As you move from project to project you begin to understand more and more that the restoration and preservation of Mies van der Rohe’s architecture succeeds best wherever the greatest scope possible was given to a decidedly forensic analysis of the existing materials. 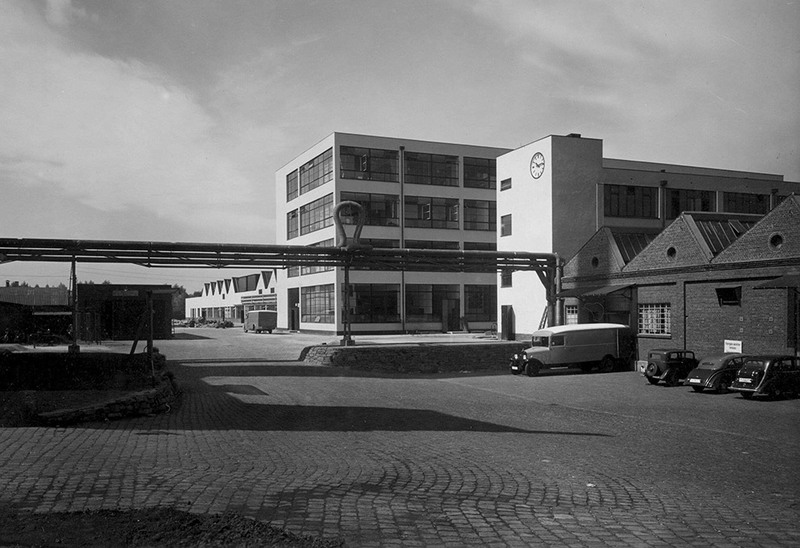 Discoveries become possible that are visible neither in original plans, nor in historical black-and-white photographs, in particular because van der Rohe often changed the one or other detail once the project had progressed to the construction phase. By way of example, an analysis of the facade of the Tugendhat building reveals that as early as 1981-5 the edifice, which at the time was used as a municipal guest house, was restored without, unfortunately, previously analyzing, and showing no respect for the existing structure. At the time cement slurry with synthetic resin additives was applied to the facade, which had more to do with the cliché of a white international style than built reality – and ultimately caused damage, because the wall was then no longer able to breathe properly. A precise analysis conducted around 2000 of the layers of rendering and paint revealed not only the clearly yellowish original hue, but also the composition of the original coating: Instead of cement and synthetic resin van der Rohe had opted for limestone and local sand additives. Thanks to the precise scientific expertise of building conservators, this is exactly what was used in the 2007-10 general restoration. 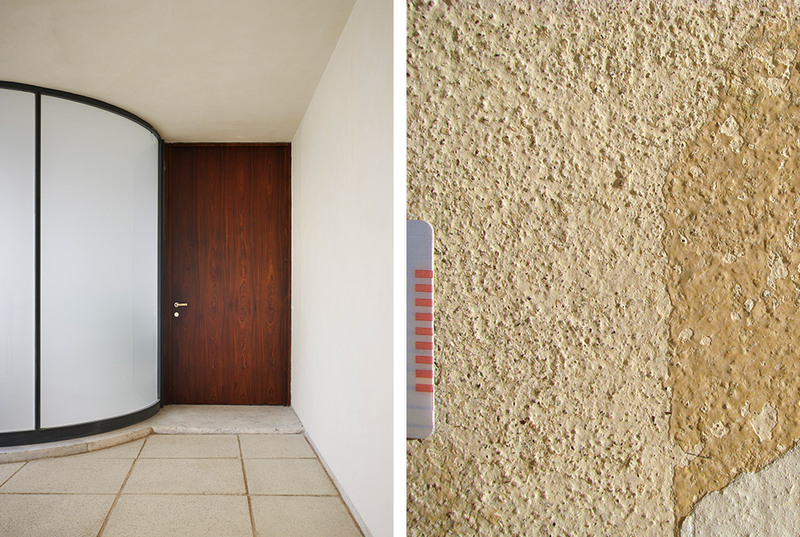 Vienna-based restoration expert Ivo Hammer was responsible for the structural studies of Villa Tugendhat; in the exhibition leaflet he calls for in-depth, scientific analyses of buildings to be included in the planning process at an earlier stage than has previously been the case with Modernist buildings. He proposes that restoration experts not only be listened to when final decisions about the paint are being made, but be commissioned to conduct in-depth studies of the entire structure of a building before work on it is completed. Mies van der Rohe’s’ buildings are the best example of the fact that surface and structure cannot be considered independently of each other. It is to be hoped that this is soon given greater consideration in and around Heerlen as well, because the very substance of many of the architectural gems in the Limburg region that are systematically presented in the Schunck outdoor display cabinet has still to be duly recognized and they should be shown proper respect in terms of their value for building culture. 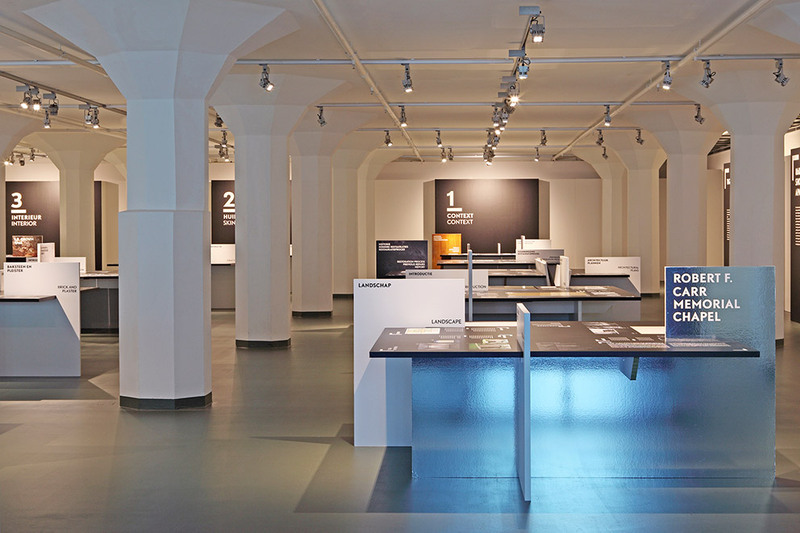 The exhibition is a scenographic-architectural journey to five of Mies van der Rohe’s buildings: The tables offer a treasure trove of information on each exemplary building.